The BBC News website this evening. All this because people play football and a man is doing his job. We probably wouldn't like what we saw today. "It could be a stoater." That's how I signed off my preview of tonight's Hearts v Celtic game. We got a rather one sided 3-0 win for Celtic. We got two red cards as the referee stuck rigidly to the letter of the law. And, above it all, we got someone from a home section of Tynecastle trying to attack Neil Lennon. Other reports suggest trouble breaking out in elsewhere in the ground in an atmosphere widely described as "poisonous." Jim Jefferies, who has seen more than most at Tynecastle over the years, said there "was something in the air, ready to kick off from the start." A poisonous atmosphere is one thing. Disliking an opposing manager is part of the game. Combining that into a platform to try and assault someone? Well, I suppose that's just beyond my ken. This season of woe and despair takes another lurch towards abject misery. A lone attacker. An eejit. A lunatic. Whatever. It seems too many of these idiots are currently feeding off a footballing atmosphere that is becoming more hysterically putrid with every passing week. Given all that's happened this season I suppose we should be thankful that the assailant seemed to be held up as he approached Lennon. And that he didn't have any kind of weapon except his own brainless bampottery. 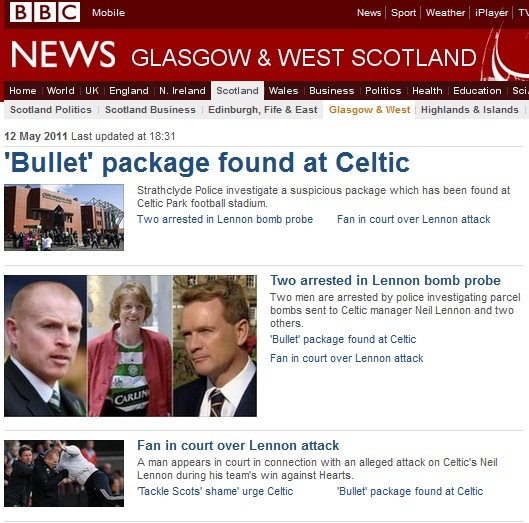 Again we ask ourselves how much of this Neil Lennon can possibly take before he walks away for his own safety? Imagine that. Scottish football in 2011. And we might be looking at a man hounded from a job he loves because his personal safety is being compromised. What does that say about Scottish football? You don't have to pretend to be a fan of Lennon to realise that something is going horribly wrong here. How can we persuade people back to the game, bring families to our stadiums, when a manager no longer seems to be safe inside or outside the ground. Hearts, the SPL, the SFA and the police will launch investigations. Hearts, I suspect, will face severe censure. But Lennon was only a leap and a sprint away from his attacker. Difficult to see what clubs can really do to stop people who see that intimacy - which should enhance the atmosphere at the game - as an invitation to go crazy. Celtic's win set up another title deciding helicopter Sunday this weekend. But the front and back pages of the newspapers, the news and sport bulletins, won't be talking about that. Instead we'll be reliving another disgraceful chapter in this toxic season. Most of us just want it to end now. It stopped being anything like fun a long time ago. And amidst talk of the severity of the incident, of investigations and concern, the authorities don't seem to have any real sense of how they can prevent it. Somehow Scottish football has descended into a morass where a minority - and thankfully it is a tiny minority that seems to either go to these extremes or condone them - think they are entitled to act like this. Most of us are sickened by this kind of thing. Most of us love the game despite everything that's been thrown at us over the seasons and this new level of madness that we're being subjected to at the moment. But how much longer can Scottish football be dragged through the gutter before we decide that this really isn't worth the hassle? And where does the game go from there? In the end Hamilton had left their late rally too late. A good couple of months too late. A season that began with back to back 4-0 defeats ended last night in relegation with a game to spare. St Johnstone ended up the executioners. But Hamilton had were the authors their own death warrant. Recent form suggested Hamilton were determined to cling on, to make a real fight it. But there was too much to do. Too much for a team that have been unfailingly ineffectual - and often just downright bad - this season. The late display of some tenacity perhaps looked more impressive because it came in a season of such misery. After losing eight goals in their two opening games Hamilton then won 1-0 at Inverness. Another six games passed without a win before they went to Motherwell and secured another 1-0 victory. That game was on the 30th October. It wasn't until the 17th of April - 22 league games later - that Hamilton won again with a 2-1 victory at Easter Road. It was that win over Hibs that sparked the mini revival, a draw against Aberdeen was then followed by a win away to St Mirren and the first home win of the season against Hibs. None of it was ever likely to be enough. Their only real hope would have been if they could play Hibs every week. Players offering quality left and the resources were not there to replace them adequately. The lack of a proper goalscorer will be mentioned in many a post mortem. And, self evidently, a return of 23 goals so far this season is woeful. But St Johnstone share that dire scoring record. The Perth side have converted those 23 goals into 11 wins compared to Hamilton's 5 and 43 points to Hamilton's 26. The lack of goals hasn't helped but it's not the only cause of Hamilton's failure. The dearth of quality runs throughout the team, the shortage of goals as much a symptom of problems elsewhere as it is a reason for their relegation. The buck stops with the manager? But Billy Reid has had Hamilton punching above their weight for a while now. He simply ran out of options. Does he now regret not leaving on one of the many occasions when his name was linked with other jobs? Worryingly for a team about to drop into the First Division is Hamilton's lack of fight at times this season. Even the more creditable results during that long spell without a win seemed to be caused more by ineffective opposition than any triumph of Hamilton's collective will. Pundits like to talk about teams on a bad run of form suddenly getting nothing but bad luck. Maybe it consoles those in the game to resort to superstition rather than lay blame or start making accusations of incompetence. But bad teams don't need bad luck or a witch's curse to go down. Being bad is often enough. And Hamilton have been bad this season. All of which should serve as a wake up call to the clubs immediately above them. There but for the grace of Hamilton's lack of ability go St Mirren, Aberdeen or Hibs. The First Division is an inhospitable place where penury rules and a long season beckons. Belts will need to be tightened. Rumours earlier this season suggested the Accies were but a couple more weeks of bad weather away from major financial collapse. Maybe that was just whisper and supposition. But they certainly look set to let a major cost cutting excercise loose on a squad that is already struggling. This year their average attendance has dropped below 3000. Only Gretna have suffered that ignominy in the SPL before. Even as they sought to establish themsevles as a fixture in the top flight Hamilton have been shedding fans. Will relegation persuade them back? A struggling squad likely to be further weakened, penny pinching the order of the day. And a real need to start somehow reconnecting with supporters. Yesterday was a dark day for Hamilton. Unfortunately for them I can't see anyone turning the light back on in a hurry. Jump in the car at Celtic Park and arrive two weeks later at Wembley. Along the way visit 20 cities and 21 football clubs in 10 different countries. And, inspired by a seven year old boy, try and raise £100,000 for charity. 21 football clubs? The 21 winners of the European Cup. That's the challenge Robin Blacklock set himself. Next Sunday the quest will begin. Joined by three friends on every stage of the journey - 16 countries will be traversed in a car provided by Ford - the team hope to meet a 'Medallion Man' at each club. That's European Cup winning players. Names like Jim Craig. Like Gerd Muller. It's a road trip reimagined as a whistle stop tour of modern European football. Robin's EuroChampsChallenge was inspired by his son Angus. Angus was born two weeks early with only one ear. That condition, microtia, also affected his mouth and speech. At the age of seven Angus has undergone over 15 operations. Undergone them with a stoic cheeriness and a love of football. It's his bravery that will be honoured by the money raised with the Sick Kids Friends’ Foundation and Changing Faces the nominated charities. The Sick Kids Friends' Foundation supports Edinburgh's redoubtable children's hospital. Changing Faces supports people in the UK with disfigurements to the face, hand or body. Robin has struck on a unique way of helping two very deserving causes. Yesterday in East Lothian a Festival of Football was held, giving Robin's home village of Aberlady the chance to give the EuroChampsChallenge team a huge send off. Hundreds of local youngsters, representing teams from across the county, were involved. I'm pleased to say that the boys did so with a talent that I rarely displayed on the same playing fields a couple of decades ago. So did the girls. There were also a number of local footballing deities on show. In a legends bounce game Paul Kane looked fat, Keith Wright looked knackered, John Hughes looked to have reinvented himself as a libero, John Collins looked like he could still play in the SPL. And Colin Nish was there as well. A great day that hopefully raised more cash towards that £100,000 target. A fun, relaxed, family day. Don't say nothing positive can come from football. And I even got my picture taken with the European Cup. Robin and the team begin their quest next Sunday. Good luck. Visit EuroChampsChallenge to lend your support.